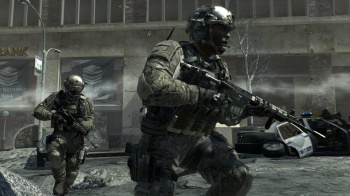 Modern Warfare 3 Dedicated Servers Leave Out the Leveling Up. Unsurprisingly , server admins are the kings and queens of Modern Warfare 3's dedicated servers. Infinity Ward has revealed that the dedicated servers for Call of Duty: Modern Warfare 3 will be unranked, so PC players wanting to level up are going to have to choose between experience points and a superior playing experience. Writing on the Call of Duty community site, Infinity Ward's Robert Bowling answered a number of questions about the PC version of the game. One of these questions was whether or not dedicated servers were ranked, and as you might have guessed, the answer was "no." It's not all bad though, because server administrators will have full control over what weapons and unlocks are available, so you if you find the right server you might not need to level up. I'm guessing that Infinity Ward, Sledgehammer, and Activision are trying to manage cheating in the game with this move, something that is a continual bugbear for the Call of Duty series. There are inevitably going to be some people disappointed by this news, and it does seems that dedicated servers and Call of Duty never quite mix properly. The post has plenty of other information about the playing the PC version, so if you have questions, then it's worth a look. Call of Duty: Modern Warfare 3 comes out for PC, PS3, Wii, and Xbox 360 on November 8th.